When anyone hears the word of the kingdom and does not understand it, the evil one comes and snatches away what has been sown in his heart. This is what was sown along the path. 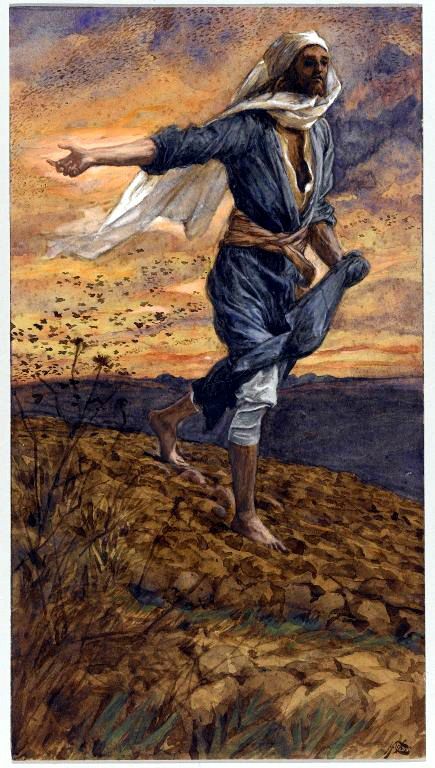 As for what was sown on rocky ground, this is the one who hears the word and immediately receives it with joy, yet he has no root in himself, but endures for a while, and when tribulation or persecution arises on account of the word, immediately he falls away. As for what was sown among thorns, this is the one who hears the word, but the cares of the world and the deceitfulness of riches choke the word, and it proves unfruitful. …He only intended to warn us, that, in many persons, the seed of life is lost on account of various defects, in consequence of which it is either destroyed immediately, or it withers, or it gradually degenerates. That we may derive the greater advantage from this warning, we ought to bear in mind, that he makes no mention of despisers who openly reject the word of God, but describes those only in whom there is some appearance of docility. But if the greater part of such men perishes, what shall become of the rest of the world, by whom the doctrine of salvation is openly rejected? But he that received the seed into a good soil… None are compared by Christ to a good and fertile soil, but those in whom the word of God not only strikes its roots deep and solid, but overcomes every obstacle that would prevent it from yielding fruit.